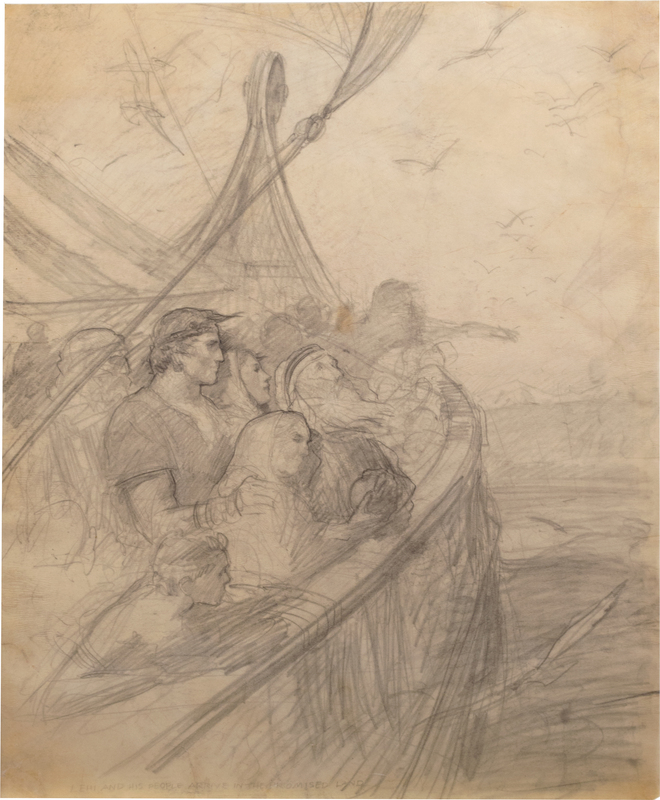 Book of Mormon Central / Archive / Sketch of "Lehi and His People Arrive in the Promised Land"
Title Sketch of "Lehi and His People Arrive in the Promised Land"
22 3⁄4 x 18 in. Perhaps the most iconic of the twelve Book of Mormon paintings, for decades Lehi and His People Arrive in the Promised Land was the first image visible in the mass-produced edition of the Book of Mormon. This is among the final drawings for the work and is completely faithful to the final painting. Depicting the scene described in 1 Nephi 18:23, it shows the moment that the Prophet Lehi and his family approach the Promised Land. Following a vision given to Lehi, his family left their comfortable life in Jerusalem to be led through the wilderness and across the ocean. Despite physical privations and frequent serious disputes between family members, through their combined efforts they constructed a ship and travelled to the Promised Land. Friberg makes us a witness to the moment land is sighted. In the background, we see land birds approaching the ship and an arm stretched out, enthusiastically pointing to the horizon. Rather than looking towards the land, Lehi looks heavenward in acknowledgment of the “hand of God bringing us forth to the land of promise” (2 Nephi 1:24). Leaning on his shoulder is his wife, Sariah. Behind them stands Nephi, who would inherit Lehi’s prophetic mantle, and in the foreground, leaning over the ship, is Jacob, who was born to Lehi and Sariah in the wilderness and who would follow Nephi as the spiritual leader of his people.